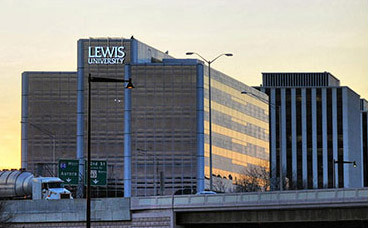 Lewis University at Oak Brook provides convenient, accessible classes to our working adult students in a professional setting. During the day, the location serves as an ideal educational environment for businesses and associations to use for meeting and training purposes. Located in a prime research and development corridor, near many corporate headquarters, the 30,000 sq. ft. facility features 15 classrooms, state-of-the-art nursing simulation labs and “outpatient” offices, a lounge, 3 conference rooms, 2 computer labs and additional computer area with multiple workstations. The building is located directly across from McDonald's Corporation on 22nd Street and the Oak Brook Shopping Center. It is easily accessible from Interstates 88, 294, and 355, as well as Route 83. Sign up to attend an Open House or Information Session. An Open House offers the opportunity to meet Lewis faculty members in a casual setting. An Information Session will provide answers to your questions about your academic program of interest. Follow the link to sign up now.